It’s kind of weird at times that, in a world filled with Pokemon, there are still normal jobs. Like lawyers exist, doctors are around, construction folks and the like – and Pokemon somehow help out with all of these things! Well, except maybe lawyering – it’s hard to defeat a client whose attorney has an IQ of 500. TV Reporter is a Supporter card that simply says draw 3 cards, then discard 1 card. Back in the days of EX Dragon, this kind of effect would be pretty good cycling – nothing on par with Professor Oak from Base Set, but what can you do, they’re all Supporters at this point. 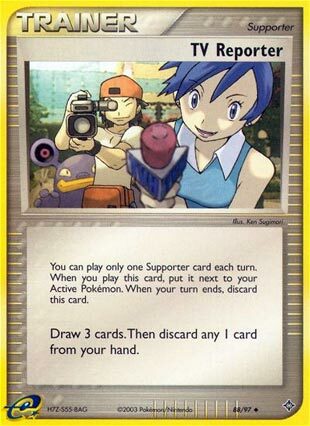 But the reason that we’re reviewing TV Reporter today is because supposedly it might have a reprint, and it seems like a good idea to figure out how good this card would be theoretically. On the one hand, it’s basically like Hau, in that it gets you 3 cards. In terms of advantage, that would make it a +2, except that you’re discarding a card from its effect, so it’s more of a +1. That makes it ultimately weaker than Hau in that aspect, so it’s not that great. On the other hand, though, there are many ways to convert that discard into an advantage, such as attaching it if it’s an Energy or recycling it as a Supporter. That way you can take advantage of the fact that you used TV Reporter in order to advance your plays. It likely won’t see much use in Expanded, as the draw Supporters of that format are so much more expansive and difficult to compete with, but in Standard where the game is a bit slower and most draw Supporters are sandwiched between “draw 2s” and Cynthia, this would likely be a welcome addition to the card pool again. So we’ll have to wait and see if the rumors are true, but in any case, TV Reporter’s a pretty neat card that’s just waiting for the right time to show up. Arora Notealus: Can you imagine what it would be like to do any job with a Pokemon in tow? Street Vendor with a Pokemon! Computer science with a Pokemon! Plumbing with Pokemon! It’s a marvel that we haven’t decided to do breeding and crossbreeding to make Pokemon a real thing!…or…or have we?! Today’s Throwback Thursdays is TV Reporter (EX Dragon 88/97, POP Series 2 11/17, EX Dragon Frontiers 82/101), which will eventually be released again due to appearing in Japanese’s Champion Road subset. This Supporter card lets you draw three cards and then discard one card from your hand. This card was reviewed once (https://www.pojo.com/COTD/2004/Jan_2004/27.htm). This review was favorable for it’s time, as the rival to this card was Bill’s Maintenance (which will also be re-released in that same set). That was before, but now? There are far better Supporters than TV Reporter. We’ve got Cynthia that shuffles your hand and draws six cards. As for straight draw, there’s Hau that draws three cards without the discard; Sophocles draws four cards, albeit discarding two cards from your hand first. The discard from TV Reporter may be niche as one can discard a card from your hand only to be recovered later on. TV Reporter (DF 82) will return to the Standard meta in the Champion Road set coming out in August. This card allows you to draw three cards but then you have to discard a card. My initial thought was, “It’s worse than Hau! Why are we reviewing this?” But as I’ve been playing (and winning a ton up to 17 W 3 L now) with Ultra Necrozma Malamar, it’s becoming very clear to me that it’s really important to get Psychic energy into your discard early on. The advantage that TV Reporter has is that if you don’t have a card you want to discard in hand, you can take a chance, play TV Reporter, and maybe one of the cards you want to draw into will be a card you want to discard. Unfortunately, it’s still only three cards, and that’s just not enough in today’s meta… however, in a meta with Magcargo and Swampert, this card might just make some sense. If you have a Swampert on your bench that lets you draw three cards for a cost of discarding one, and a Magcargo as well that lets you hand pick one of those cards, TV Reporter might actually be a potential option in a deck. After all, the Swampert, Magcargo, TV Reporter combo gets six cards in your hand (one of which is chosen by you) at a cost of two cards total. That’s not great, but you don’t have to reshuffle or discard everything in your hand. Post Sycamore, it might not be a terrible pairing with Cynthia. After rotation, we’re going to have to get creative in what we’re going to use for draw support cards. Fortunately, it looks like there will be a variety of different options to replace Professor Sycamore, and TV Reporter might very well be one of them. I think it will see some use but not a whole lot. It’s hard to tell, however, and evaluating different options for draw support come September is something I’ll have to look at before too long. Today we look at TV Reporter… and I am typing this up on the tablet I received this past Christmas. Relevance? There is a reason I don’t do that very often. It was a nicer gift than expected and my only tablet, but the poor thing is struggling to load this page while I struggle to type on the slightly undersized keyboard (especially while trying to avoid accidentally hitting the touch pad). Correcting simple typos and misspellings is an adventure right now, but either I type this now or never. Getting down to it, a Supporter that draws three but then makes you discard one seems like rubbish, but back in the day it was very competitive. TV Reporter enjoyed a few years of being the generic draw card for most decks, or at least the one that didn’t require you shuffle your hand away first (Professor Oak’s Research), have a highly variable output (Copycat), or sometimes troubling stipulations (Steven’s Advice). Nearly all decks had supplemental, non-attack Pokemon-based draw at this time, and towards the end of this card’s competitive run, similar deck searching options. In fact, we are soon getting a reprint of TV Reporter, but of one of those search effects (Smooth Over Magcargo). Will that make TV Reporter great again? Nope. For one thing, a day or two ago we found out that Acro Bike is also being reprinted in Japan, so we may eventually receive a Standard-legal reprint here. I can’t look up Japan’s current format (it differs from our own), so sometimes reprints of cards we’d call Expanded-legal don’t bring anything back for them… and thus never release over here. If Acro Bike returns, then even after we’ve all lost N and Professor Sycamore due to rotation, only fear of anti-Item effects would make TV Reporter the better choice. Even taking into account that TV Reporter lets you discard a card from your entire, newly enlarged hand and not just one of the top two cards from your deck. Decks that need an incredible amount of discards or that must avoid shuffle-and-draw effects are the only ones which need consider TV Reporter.